It’s perfectly normal to have fears about going to the dentist, especially for children. Dental anxiety is a common condition experienced by both children and adults. Because oral health is so important it’s necessary to overcome these fears and find ways to manage behaviours around visiting the dentist, so that your child can keep their smile healthy from the early years and into adulthood. Finding a dentist who understands dental anxiety and is willing to work with both you and your child to ease their fears will help make the process more enjoyable for everyone. There are also some things you can do to help manage your child's behaviour before, during and after their dental appointments. Tell your child in advance that they have a dental appointment, rather than spring it on them at the last minute. This will give them an opportunity to mentally prepare for the appointment, and for you to talk about their concerns before you get there. Bring along a favourite toy or book to provide your child with something familiar and comforting while you’re at the dental office. Familiar items can be a helpful and calming distraction for your child during the visit. Keep calm. Although it can be difficult to stay calm while your child is having a hard time, speaking gently to your child will make them feel safer and at ease. Give your child praise for attending their dental appointment. 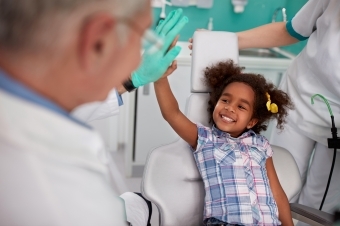 Applauding them for their bravery and good behavior during a dental visit can make a world of difference, and set them up for success for future dental appointments. If your child is experiencing dental anxiety, contact our children’s dentists in Langley to learn how they can work with you to help put your child at ease.